Recently, toward the end of a group clinic, I had the participants play out points to help further ingrain (in real time) the things we worked on. It was an exercise in seeing how well they were able to stay focused on applying what they had learned while working to win the point. This made me think about so many aspects of playing tennis that truly make it a thinking, as well as physical, experience. These aspects can be looked at as an over-all awareness of not just what's going on during play, but what you can do to affect and, it is hoped, control the play in your favor. To start, do you have a shot that you can execute with relative ease and consistency - one that you'd be more comfortable to hit on critical points, if possible? Being aware of your self confidence in that shot and working yourself into a position to execute it is another aspect of staying focused. Now, by the time you've played a couple of games into a set, your opponents should reveal most of their strengths and weaknesses. Your awareness of this can help determine what you need to do to play your strengths to their weakness. Staying focused and hitting shots, especially the ones you do well, that make them uncomfortable can create many unforced errors in your favor. Next comes awareness of conditions that you don't have initial control of, but have to (once again!) stay focused to work with them, preferably in your favor. They include wind, sun, heat, cold, court surface and court condition. All these can affect the type of shot you'll try to execute. In dealing with this aspect, be aware to hit more to the open space in the court, or at your opponent's feet. My high school coach used to say "If you can't hit the open spaces, go for their shoe laces." Speaking of coaches, the last awareness I'll mention is one that a coach I had in college was "death on." During practice matches, he would stand behind the windscreen and ask, quite forcefully, "Score, please?" He did this when he noticed that the score wasn't being announced before every point. If you didn't know the score it was laps around the courts after practice. His point: If you're not aware of the score, how can you be focused on your game? Beyond that, being aware of the score allows for you to know when to be aggressive (you're up by a couple of points), or conservative, going for more placement over power (your opponent's ad). 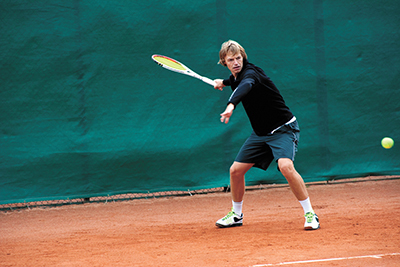 Adding an all-encompassing tennis awareness to your game should help further sharpen your focus.